An extract produced by a human intestinal parasite can reverse the symptoms of asthma in mice, scientists in Australia have discovered. The hygiene hypothesis is partly founded on the observation that the the more people there are with parasites, the lower the rates of inflammatory and allergic diseases, like asthma, in the population. 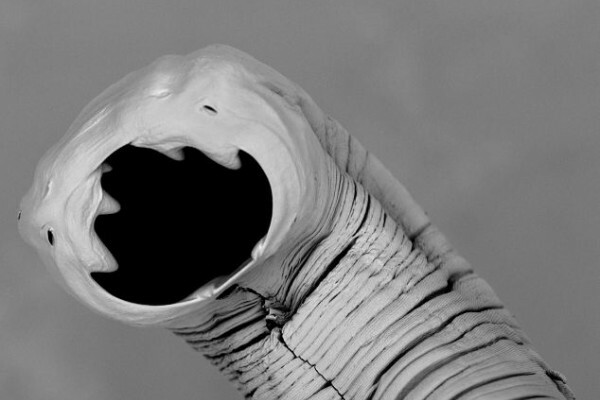 To account for this, scientists have suggested that long-lived species like intestinal hookworms, which latch onto the gut wall and survive for years by drinking the blood of their hosts, secrete factors into the bloodstream that camouflage the parasite against immune attack. One side effect, researchers speculate, is that this can also reprogram the processes that cause allergies. In recent studies on thousands of people in Ethiopia, worm infections were indeed associated with lower rates of asthma. Treating people like these with drugs to rid them of their parasites was been found to provoke a surge in allergy symptoms and wheezing afterwards, suggesting a link. Now Severine Navarro and her colleagues at James Cook University, Cairns, have uncovered what they believe is a key factor that these parasites use to control the immune system. If they're right, and their findings published this week in Science Translational Medicine also play out in humans, then they may have uncovered, as they put it, "a novel curative therapy for asthma." Working with experimental mice, the Australian team show that a protein, which they dub AIP-2 (anti-inflammatory protein 2), that is produced by hookworms (scientific name Necator americanus) re-balances an allergy-prone immune system and switches off the responses that causes airway damage and inflammation. In the study, mice with the rodent equivalent of asthma received a short course of injections of AIP-2. Compared with control mice, the lungs of these AIP-2 treated animals showed significantly improved markers of inflammation and lung function. The effect was also persistent because animals studied several weeks showed sustained improvements in the status of their airways. Following administration, AIP-2, the researchers have found, enters lymph nodes adjacent to the intestines where it triggers the proliferation of a specific population of immune cells called CD103+ dendritic cells. These have a role in driving the production of immune-dampening cells called regulatory T cells (Tregs), which then track to the airways and suppress immune responses to potential allergens, like the house dust mite proteins which cause asthma. After the administration of AIP-2 the numbers of Tregs in the animals' airways doubled, but if the CD103+ dendritic cells were not present the protective effect was lost. Critically, the immune response, including to agents like vaccines, was otherwise unaffected, and the animals showed no apparent ill-effects from the administration of AIP-2 or an immune reaction against the protein. The team acknowledge, however, that this is a mouse study and therefore needs cautious, but optimistic, interpretation in considering how it might translate to human patients. "This class of biologics has appeal for a broad range of inflammatory diseases that are driven by an imbalance between pro- and anti-inflmmatory T cell responses and have reached alarming prevalence in indistrialised nations." Is being too clean responsible for the rise in allergies?